When Norwegian Cruise Line President and CEO Kevin Sheehan appeared on the reality series “Undercover Boss” on Jan. 2, he made a $100,000 addition to the crew enrichment program during the show’s finale, which took place in front of more than 800 crew members on Pride of America in Hawaii. The enrichment program is a fleet-wide initiative to support and enhance the welfare of the company’s more than 14,000 crew members. This includes a variety of activities, equipment and events for the crew of each ship, such as DVD movies, sports equipment, parties, karaoke and entertainment, video game equipment and more. On Pride of America, Sheehan worked with John Nersten, a deck repairman in the deck and engine department. Nersten was very appreciative of Sheehan’s offer to fly him, his wife and new baby from his home in Saipan near Guam to visit his parents and extended family in New York. While there, they will be treated to a seven-day cruise from New York. In addition, Sheehan made a $10,000 donation in Nersten’s name to the Families of September 11, a non-profit organization that raises awareness about terrorism, as a tribute to Nersten’s patriotism following the Sept. 11 tragedy. Despite being over the age limit, Nersten enlisted in the military following Sept. 11 and served his country for two years. On Norwegian Epic, Sheehan worked with Recreation Host Jessica Barnes, a Pittsburgh native and recent college graduate. Sheehan was impressed with Barnes’ guest service skills and invited her to join the company’s management training program. Barnes begins her new position at the corporate headquarters in Miami this week. In addition, Sheehan treated Barnes’ parents to a cruise on Norwegian Epic so they could see their daughter at work. While working with Barnes, Sheehan also decided to remove the ship’s ice skating rink and change the rappelling wall waiver system to an electronic version. Also on Norwegian Epic, Sheehan’s true identity was revealed by Silvia Veigas, a waitress in the Manhattan Room restaurant. Veigas is on her seventh contract with Norwegian and is originally from India. Sheehan was impressed with Veigas’ work ethic, dedication and good rapport with guests. 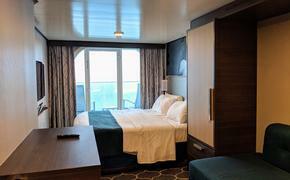 During their conversations, Veigas had many suggestions for enhancements to the Manhattan Room and to the overall crew experience. Sheehan promoted her to senior waitress and appointed her to the ship’s advisory board to help implement crew suggestions. In addition, he offered to give her and her partner a wedding on board. Sheehan also donned angel wings and led 1,000 party-goers at the company’s signature White Hot Party in a line dance with the assistance of Michael Guida, a member of the cruise staff and a native of Buffalo, N.Y. Sheehan recognized Guida’s commitment by promoting him to assistant cruise director on Norwegian Epic. In addition, Sheehan, who had lost a brother unexpectedly, sympathized with Guida, whose mother passed away suddenly from brain cancer. Guida and his family had made a commitment to raise money for cancer research and are in the midst of planning their next fundraiser. Sheehan pledged to match the amount that Guida and his family raise at their next event. For more information, visit www.ncl.com/undercoverboss.